For Bally and Stern solid-state pinballs, 1977-1985. Replaces the original C23 filter capacitor (11,700uF 20vdc or 10,000uF 35vdc) on the solenoid board, which filters power for the 5-volt logic power supply. Excellent replacement for obsolete original Bally part # E-00586-0062. This modern replacement cap is rated at 15,000uF / 25vdc, and is slightly smaller in diameter than original part, but will well outperform and outlast the original style capacitor. When old capacitor starts to fail, it can cause the game to reset or lock-up during play, or cause game to not start up at all. Common replacement part in these vintage games, and a MUST for reliability. Best to replace before problems start! We replace these on ALL older Bally and Stern games that come through our shop. 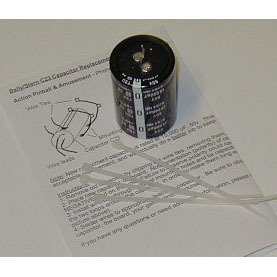 Kit includes capacitor, instructions, and correct length nylon tie-wraps for mounting to PC board. Requires moderate skills with electronics and circuit board work, component ID and handling, soldering/desoldering, and necessary tools/equipment. See our Technical Articles page for suggested board modifications you should make when replacing this part.